As had been expected, a wet "Duck Factory" in the Prairie Pothole Region of the northern U.S. and southern Canada has led to a strong breeding effort this spring by most of the major duck species that wing south each fall across North America. That was confirmed today with the release of the U.S. Fish and Wildlife Service's 2014 Trends in Duck Breeding Populations report. Based upon the recent breeding population and habitat surveys conducted across more than two million square miles of waterfowl habitat across the U.S. and Canada, the Fish & Wildlife Service has placed the preliminary estimate of the 2014 breeding duck population at 49.2 million birds. That figure represents an eight-percent increase over last year's estimate of 45.6 million ducks, and is a 43-percent increase above the long-term average. In addition to being only the eighth time in the survey's history (from 1955 until the present) that the total breeding duck population has exceeded 40 million birds, this year's figure marks the highest level of breeding birds ever recorded by biologists. The previous record breeding benchmark was 48.6 million ducks based on the spring surveys of 2012. Northern shovelers (5.28 million) are at all-time record high breeding levels this year. Not far behind are mallards (10.9 million), gadwalls (3.81 million) and redheads (1.28 million) which are at their particular specie's second-highest breeding indexes ever recorded. And green-winged teal (3.44 million) and blue-winged teal (8.54 million) check in this spring at their third highest breeding levels ever observed. All in all, it's a spring of good news for waterfowl hunters looking forward to this year's fall flight of ducks. “It looks like another good waterfowl breeding year for a good portion of the prairies and the boreal forest,” said Dale Hall, the CEO of Ducks Unlimited, in a news release. “Precipitation in the form of snow and rain has provided sufficient water to fill important wetlands in key breeding habitats. We hope this will result in good production and another great flight of birds migrating in the fall. In light of the report released by the USF&WS, the president of Delta Waterfowl agreed that this spring's duck production looks excellent. "Exceptional water this year will lead to high duck production,” said Dr. Frank Rohwer, president of Delta, in a news release. Why such a high spring breeding index number this year? DU says that the main determining factor for duck breeding success is wetland and upland habitat conditions the Prairie Pothole Region (PPR) of the northern U.S. and southern Canada along with similar habitat that is found in the boreal forests of northern Canada. This spring's total pond count numbers for the U.S. and Canada stood at a combined 7.2 million ponds according to DU. That figure is similar to last spring and is some 40 percent above the long-term average (1955-2014). What's more, Delta Waterfowl notes that in addition to most of the PPR (which includes much of Alberta, Saskatchewan, Manitoba, the Dakotas and eastern Montana) being very wet this spring, conditions are even better now. That's because many areas of the PPR are even wetter now than they were a few weeks ago when the 2014 spring surveys took place. What does all of this mean as far as individual duck species breeding numbers are concerned? •	Mallards: 10.9 million, up five percent from the 2013 breeding number and 42 percent above the long-term average from 1955-2014. •	Gadwall: 3.8 million, up 14 percent from the 2013 breeding number and 102 percent above the long-term average. •	American wigeon: 3.1 million, up 18 percent from the 2013 breeding number and 20 percent above the long-term average. •	Green-winged teal: 3.4 million, up 13 percent from the 2013 breeding number and 69 percent above the long-term average. •	Blue-winged teal: 8.5 million, up 10 percent from the 2013 breeding number and 75 percent above the long-term average. •	Northern shovelers: 5.3 million, up 11 percent from the 2013 breeding number and 114 percent above the long-term average. •	Northern pintails: 3.2 million, down three percent from the 2013 breeding number and 20 percent below the long-term average. •	Redheads: 1.3 million, up six percent from the 2013 breeding number and 85-percent above the long-term average. •	Canvasbacks: 685,000, down 13 percent from the 2013 breeding number but still 18 percent above the long-term average. •	Lesser and greater scaup: 4.6 million, up 11 percent from the 2013 breeding number and eight percent below the long-term average. •	Black ducks (from the Eastern Survey Area): 619,000, down one percent from the 2013 breeding number and one percent below the long-term average. What does all of this biological number speak mean? 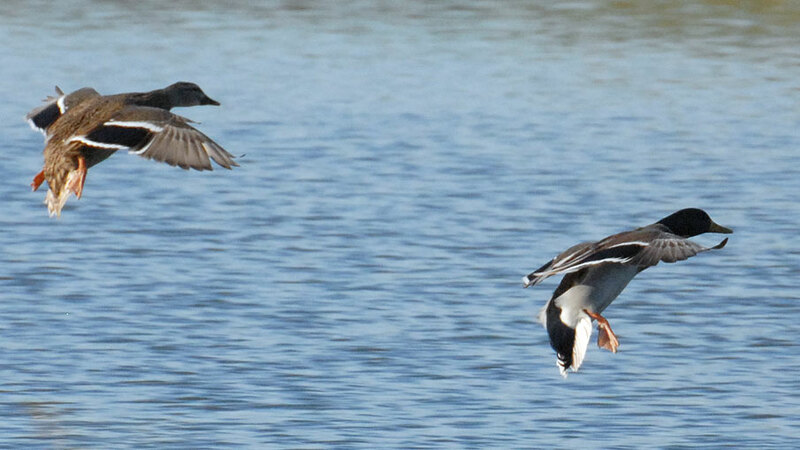 "Rejoice in the great breeding pair counts,” said Rohwer in the Delta Waterfowl news release. “Better yet, rejoice in the good May pond counts and continued good water conditions. Over at DU, chief biologist Scott Yaich sounded a similar refrain. “This spring, as has been the case for the past several years, saw abundant moisture across much of North America's most important duck breeding areas,” said Yaich in a DU news release. “That bodes well for duck breeding success this summer and, we hope, for hunting this fall." Up at Delta Waterfowl, Rohwer agrees. “We know that when breeding duck numbers are high and duck production is strong, hunters shoot more ducks,” said the Delta Waterfowl president. “However, three other factors are probably as important as the breeding duck count," he added. The bottom line is that by nearly all early summer indications, a great fall of duck hunting should take place later this year across most of North America. But both Yaich and his DU boss Hall used the good news as an opportunity to remind hunters of a nearly inescapable truth. And that's this, that despite another year of abundant precipitation, one day, the drought cycle will return to the famed "Duck Factory." And that is why both men say that much work still remains to be done to conserve and restore vital wetlands and upland breeding habitats being lost to various concerns. "(We) remain concerned with the continuing and escalating loss of nesting habitat in these areas," said Yaich in the DU news release. "Because ducks need water, wetlands to hold the water and upland habitats to successfully raise their young, the ongoing loss of grasslands and wetlands across the Prairie Pothole Region will increasingly impact the number of ducks in the fall flight in the long-term," he added. Hall says that hunters should enjoy the fruits of their labors this fall, all while remembering that the overall battle for North America's wetlands and waterfowl is far from over. "DU and its partners continue to work hard to protect and restore habitat to provide for the needs of these birds and so much more," said Hall. "While we still have much work to do in delivering habitat and securing key conservation policies for sustaining these populations, we are heartened by the good results we have seen in the past few years." That would seem to be especially true this year. Because barring any unforeseen complications the remainder of the year, a tremendous flight of ducks should be coming to a marsh, a pothole, or a reservoir near you later this autumn when the north winds finally begin to blow again.